The West Antarctic ice sheet is collapsing due to global warming. 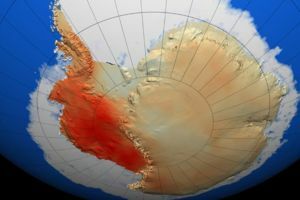 Three studies have all concluded that the West Antarctic Ice Sheet has begun to collapse. This collapse will impact humanity for generations to come, and the indications are that it is too late to stop it. Loss of rice-growing areas across Asia including Vietnam, Bangladesh, Egypt and China (3 million hectares). This page was last modified 02:24, 18 June 2014. This page has been accessed 10,872 times.